PBTV has been working hard this fall, onsite with a full slate of awards, events, shows and crowd-pleasing projects. Ranging from television broadcasts to theater stages, from special events to concert tours, PBTV is there with LED video solutions. The PBTV Fall 2018 Newsletter has more about the LED solutions PBTV supplied to designers and producers on projects for NFL Kickoff Concert, Phish Halloween show, BET Hip-Hop Awards, SNL Season Opener and debuting the new digiLED DLPi2.84 LED modules. Missed out on the action? Sign up to our newsletter to make sure you don't miss out! 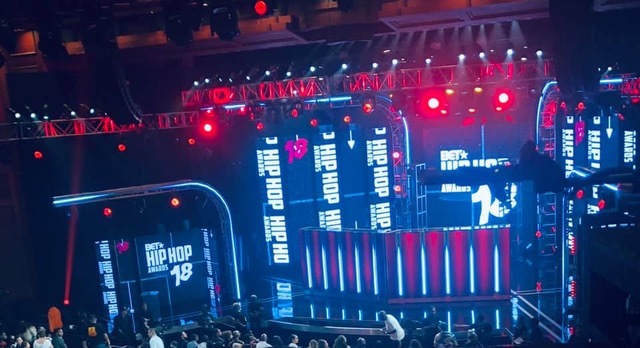 Pete’s Big TVs was proud to support the recent BET Hip-Hop Awards. For the show which aired on October 16thfrom the Jackie Gleason Theatre in Miami Beach, FL, PBTV supplied LED products and projection for the production.The main center screen measured 15’ wide x 16.4’ feet high of digiLED MK7. There were SL and SR vertical panels of the digiLED MK7 modules as well and the DJ riser was covered with MK7 modules. PBTV supplied 90 digiLED iMAG-R 3.2mm LED modules for the large panel behind the presenters. PBTV also supplied two Barco HDX W18 DLP projectors and screens. Click below to see T.I.’s performance and the PBTV screens in action. PBTV has added a new, ultra-high-resolution LED product, the digiLED DLPi2.84. With a pixel pitch of 2.84mm, the new digiLED DLPi2.84 LED module offers designers a rugged, ultra-high-resolution LED product. Black shell 3-in-1 SMD LEDs offer designers and content creators ultra-high definition images. The DLPi2.84 features 18-bit cards that allow for free rotation as well as providing content creators and designers better grayscales and colors. The DLPi2.84 is both front or rear serviceable with power supply, processor, or components all modular for easy servicing.